Good evening, everyone. We are presenting this evening the latest literary work by Raffaele Lauro. The work, which concludes “The Sorrentine Trilogy”, “Dance The Love - A Star in Vico Equense”. The extraordinary protagonist of this novel is a woman capable of abandoning dance at the height of success to chase a life project, perhaps the most fulfilling one for a woman: that of wife and mother. A woman capable thanks to her open mind and heart to insert herself in special contexts and to integrate perfectly. I think for example of the English social context, which Violetta turns into a project of cultural and social rebirth after the end of World War II. She perfectly integrates also in the Italian social context, particularly the Southern context. The novel strengthens the delicate common thread between the Sorrentine Peninsula, the island of Capri, the Amalfi Coast and Russia. Those lands only appear distant, because not only the beauty of places known by us, but also the whole series of historical events nurtured the myth of the Sorrentine Peninsula in Russia. We are reminded about this in particular by painter Sylvester Shchedrin, who after his stay in Venice and Rome, becomes amazed by the Sorrentine Peninsula, and chooses it as a main source of inspiration for his painting art. Many Russian exiles, who at the beginning of the twentieth century arrive to Capri, remind us about it too. Maxim Gorky stayed in Capri for seven years, from 1906 until 1913, and created a political and cultural workshop, where all the Russian exiles could discuss democracy, syndicalism and revolution, which encouraged another prominent Russian, Lenin, to arrive to the island to monitor the revolutionary orthodoxy discussed in the political workshop. We cannot forget about Positano and the archipelago of Li Galli. The archipelago was purchased in the first half of the twentieth century by the first class star on the firmament of dance, Lèonide Massine, who wanted to build there a great open air amphitheatre, a world school of dance. He would have succeeded if the wind and the tides had not prevented him. The islets were then purchased in 1989 by Rudolf Nureyev, another great dancer, who, however, was able to enjoy them only for a few years, from 1989 to 1992, as he passed away at the beginning of 1993. There are also the highlights of our recent past to confirm this trend. Indeed, in recent years, the Russians have seen the Sorrentine Peninsula no longer as a place where you can relax and heal body and spirit, but also, and above all, as a place to invest their capital and do business. I quote two episodes from 2012 and 2013. In 2012, a girl born in 1990, currently 26, bought Villa Astor, the famous Villa Tritone, one of the most prestigious villas of Sorrento, for 35 million Euro, because of archaeological finds that it preserves and botanical species that it guards, but, above all, for the historical characters that it had accommodated. The last of them is perhaps the most important one, Benedetto Croce, in 1943 and in 1945. In 2013, Villa Niccolini in Sant’Agnello, another piece of the history of the peninsula, was bought by a Russian businessman, former president of the Russian Confederation of Trade Unions. All these topics will be discussed tonight by the respected speakers, whom I present: Angie Cafiero, blogger and President of the Committee for Equal Opportunities, Solicitor Mariolina Costagliola, Solicitor Francesca Attanasio and Carla Coppola, San Carlo dancer and dance teacher. Before the speeches I give the floor for the words of welcome to Mayor Giuseppe Tito and Councillor Biancamaria Balzano, whom I thank for organising this splendid evening. Thank you. Good evening, everyone! Thanks to Ciriaco Viggiano I am proud to be a citizen of Meta! I thank all the present. Tonight we are going to present the work of my friend Raffaele Lauro, who, in addition to being the teacher of so many young people in our land, an important politician, a man of culture, and a writer, is, above all, a man who loves his homeland. The work which we are presenting this evening, “Dance The Love - A Star in Vico Equense”, represents along with the other two books of “The Sorrentine Trilogy” a complex hymn to the beauty of our land. For this reason I thank Professor Lauro on my behalf and on behalf of the city that I represent. In the next communal council I will propose the awarding of honorary citizenship of Meta to Professor Lauro. A small gesture for a great man, a man of immense knowledge of this land, a professor, a man of State, a person who has given and gives prestige to our peninsula and to our beloved Meta. Thank you for everything, Raffaele! Good evening, welcome everyone. 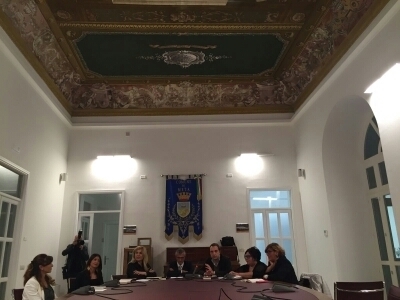 Following what was said by the Mayor, I want to thank all the present, the authorities and all the speakers at the presentation of the novel of Professor Lauro, which concludes “The Sorrentine Trilogy”, “Dance the Love - A Star in Vico Equense”, dedicated to a very brave woman, Lady Violetta. Lady Violetta is an étoile, a star of dance, one of the main interpreters of the art of Terpsichore of the past century. Therefore to reduce the novel of Professor Lauro to just a love story, frankly, does not seem exhaustive. The author, as mentioned by the Mayor, in fact, in addition to being an influential politician, a senator in the last Parliament, is also a fine writer, a fine teacher, a keen observer, so much so that this work is also a political novel, a historical novel, a novel that enhances our beauties, especially the art of the Italian Renaissance. I tell you that this is also a political novel, because the main character, who for over fifty years has lived in Vico Equense, was born in Russia, where she was artistically formed at the Bolshoi Theatre in Moscow, and, following the events that have seen Russia engaged in World war II, she left the country and was able to move to London, where she triumphed in her career as a dancer. Surely, the book gives us important signals, signals that almost represent teachings. For this, I invite those present to read and to encourage to read this novel, because, as I said, it’s also a tribute to the Italian Renaissance that the main character had appreciated since birth on her Father’s legs, who then took her to theatre for the first time when she was only seven. It is an interesting, heartfelt and deep story. Thank you all for your attention. Good evening, everyone. The Mayor was keen to point out that I am the President of the Committee for Equal Opportunities, but my speech this evening focuses on the passion I have for gastronomy. I’m a blogger, for fifteen years I’ve been writing about cooking on the web and I am known precisely in this area. I’m the president of a gastronomic fundamentalist group that embraces a cuisine which differs from what is in fashion. A gastronomy linked to traditions and which you can inhale from the pages of this beautiful book by Professor Lauro. A book, which narrates the cuisine of our land setting gastric juices in motion, especially when it describes the preparations that Signora Savarese put on the table for Violetta, who being a dancer does not eat a lot, because for obvious reasons she cannot overdo it at the table. Rather than talking about the products of our land, it is my habit to extract in the novels the passages dedicated to gastronomy, those which narrate the food. What caught my attention in the book of Professor Lauro is the story of Violetta’s ninth birthday. On that occasion, her father prepares a cake called the “Napoleon”. This thing awoke great curiosity in me and I went immediately to check my collection of books on cooking and more, because I'm passionate about food culture, not just the recipes. So, I went to see what the “Napoleon” cake was and I discovered that, in fact, it is French puff pastry prepared at the time with butter cream and layers of pastry dough. In 1912, in Russia, to commemorate the hundredth anniversary of the liberation of Moscow from Napoleon, this cake became a real symbol and it could be found in all bakeries. The reason it is called “Napoleon” is probably due to the layers of puff pastry interspersed with cream, which resemble the hat of Napoleon Bonaparte. In all this, Violetta’s father admired Napoleon despite being Russian, so the cake was also really liked in the family. My speech concludes here. Thank you for your attention. Good evening, everyone! When I was asked to discuss this book, for a while I felt in distress. I thought about the choice that this woman made in 1956. A difficult, different choice, which truly moved me. The book shows a great knowledge of the writer. It contains descriptions of places foods, particular historical moments, which we perhaps are not able to understand in detail, because we haven’t lived them. We cannot understand, for example, what it means to be controlled by the Russian secret police, and what it means to get away from everything. So, at first, I thought of Violetta as an anachronistic figure when compared with today. Therefore my attitude to this book was at first very critical. However, I looked at this figure of a woman with a lot of attention, in comparison with everything I had been taught by my mother: independence, coping on my own, being able to be myself. How can I, then, combine these teachings, so strong, with the experience of a woman who suddenly left everything for love? For this reason I asked myself a few questions, small reflections that I will share with you. The answers I gave to myself may be right for me, but not for everyone. The first question: would I have done it? Would I have made that choice? Would I have left my career in the height of success, a sign of further and probably even more brilliant future? Would I have done it? And how many women would make such choice today? I haven’t been able to give myself an answer yet. I thought that us women, we have worked so hard to arrive here, fighting hard for our rights. So why would me or you have to do all this, betraying the battle of the women who were there before us? Why can’t I love and at the same time follow my career and my professional aspirations? Why can’t I do this? Is there more love in a woman who works compared to a woman who doesn’t work? To a woman who’s a mum, a wife and also works? I thought, then, of having to put it another way. I considered: what if this love was so strong that it can justify such choice? And what if this love was her true realisation? Here, perhaps, I understood everything because I thought: it is true that we, women have had to work hard just to get to achieve the results that are today our independence and our dignity. The dignity of gender. Why, then, should we condemn this choice, if the dignity of Donna Violetta, her realization, was really what she did, that is choosing to leave her job, her career and success to become a wife and a mother? Thus my point of view has changed. Thank you for your attention. Good evening, everyone! I have to thank my friend and colleague, Solicitor Biancamaria Balzano, who today as the Councillor for Culture of Meta gave me the opportunity to participate in this meeting. Thank you, mainly because this event gives me the opportunity also to remember our first meeting, connected to the world of dance. I have known Biancamaria for forty years. We met in a hall of a dance school where we were sent by our parents. From that moment we had walked hand in hand for many years, although, at some point our paths led us apart because she left dance before me, I also did, and then I left to pursue higher education and legal career. Thank you. The novel of Professor Lauro gave me the opportunity to relive the emotions and feelings of my youth, of me at the age of fifteen, spent on training as a classic ballerina. I also got to make comparisons between Violetta’s and my parents. While Violetta’s parents believed in her, for her skills, her expressive potential and talent, my probably wanted for me a different future, a more traditional profession and, therefore, they did not allow me to express myself as I wanted and according to what my dance teachers described – the two dancers of the San Carlo who believed I had talent. The novel, therefore, gave me the opportunity to think a lot about some of the most important years of my life. What can I add that has not already been said by so many respectable voices that preceded me? It is a historical novel, because, in any case, the life of Violetta is dotted with a series of historical events and episodes. I was struck by one of those in particular, referring to the regime of Stalin, which she experienced as a teenager: Violetta’s mum, after years gone by, goes to visit her daughter and hands her a letter that Violetta sent to her many years earlier, in which she described the landscape and monumental wonders of Florence. This letter was intercepted by the KGB who censored everything about this beauty. The censorship prevented Violetta’s mother to become aware of everything that was Florence. Disappointed Violetta had to describe to her mother all that she had not been able to read in that letter. It is a Bildungsroman because, of course, it follows the path of Violetta’s life, gets us to know her childhood, adolescence and maturity. It is a love story, because it is focused on the love story between Violetta and Fernando Savarese. Finally, it is also a picaresque novel in certain ways, about the many adventures in the life of this woman. This novel gave me the opportunity to revive a few thoughtful insights. Three to be precised. The first one: the novel shows the great love that Professor Lauro has for the Sorrentine Peninsula. This is evident from the description of the passed landscape, the wine tasting tours and the “mare nostrum”. The love for his land that I fully share, because it is a land that I love immensely. The second point concerns the two most significant male figures in the novel: Violetta’s father and Fernando Savarese. The first man is an eclectic personality, a man of culture who went beyond judgements and prejudices, who feared nothing for his daughter, in fact, who tried in every way to assist her in her path that conducted her onto theatre stages all over the world. I admired him a lot. He is truly a great father! And then, Fernando. He represents the characteristics that little benefit the contemporary man in the sense that, first of all, Fernando is a man who knows how to wait, who can wait. Today, the wait is impatient, is not something that you live with serenity and tranquility, far from it! Fernando, however, is there and he’s waiting, even on the day when Violetta bids farewell to her colleagues at the Royal Ballet, he waits at home for the return of his beloved. In that circumstance he speaks to Violetta with wisdom and maturity that I do not normally come across in men. This is to show how often we give ourselves very distant targets, however, one only needs to turn their eyes around in order to understand that it is there that we find the love of our lives. Fernando is a young man who waits and who is mature, who demonstrates particular affection. I was struck by a particular gesture of Fernando: early in the morning, after the usual bath in the sea with his wife, he leaves the water before her and waits on the shoreline, with the white bathrobe and covers her to prevent her from getting cold. It is, therefore, love made also of small and very attentive gestures. A third revelation I have had with regards to this text is about Violetta as a citizen of the world. I read this novel about a month ago. At that time, I met a friend of my cousins, on a particular occasion, during a visit to the Li Galli islands, at lunch in the residence that once belonged to Massine and then to Nureyev. This person was born and lived in Meta up to a certain age, then left to work and now lives between Zurich and Paris, but, in fact, lives mostly on planes because they move between Japan, China and the United States. I spontaneously asked them what they considered to be their citizenship. They said: I feel a European citizen, because when I go to Japan, China or the US, I am identified and I introduce myself as a European citizen. The next day, coincidentally, I read the page where Violetta says the same thing. Thank you for listening! Good evening. First of all I want to thank Councillor Biancamaria Balzano and Professor Francesca Attanasio, who invited me to the presentation of Professor Lauro’s book, “Dance The Love - A Star in Vico Equense”. This thanks is due and merited because this way I had the opportunity to read this extraordinary book, which embodies the lightness and beauty of the noble art of dance and the story within history, because it is the story of Violetta linked to a historical period described in great detail by the author. But, above all, it is a book about the life of a wonderful woman who truly impressed me. I was lucky enough to dance for thirty-five years in the corps de ballet of the Teatro di San Carlo. I graduated in 1987. In that year, Ms. Elvin was appointed director of the ballet company. I remember I saw her enter the hall, already in her sixties, a woman of uncommon beauty, grace and elegance. I was very fascinated by this. At the time I was a kid and I knew neither her life nor her artistic career, otherwise I think I would have worshipped her every day as a goddess in that room. I do not hide, among other things, that when reading the book I was often very emotional, because the story of Violetta completely captured me. A woman who, as the title says, danced the life and love After a wonderful career she tiptoed with elegance and apparent fragility out of the world of dance to devote herself, through a choice which I believe was very thought out, of great courage and great consistency, to the dance of love in a frame of the Sorrentine Peninsula that Professor Lauro praises with all its beauties in a commendable manner. The book also gave me the opportunity to read about many characters dear to me. In particular, my dear teacher Zarko Prebil, a person whom I carry in my heart, who has sadly recently passed away. A man, a great teacher, a great dancer, a great choreographer, with whom I followed my beautiful artistic career. I owe to him my breakthrough as a dancer. A man of great personality, very charismatic, whom I feared so much that I was trembling when he approached. But surely a man capable of great sensitivity and great humanity. The friendship that bound him to Ms. Elvin, in fact, was profound and disinterested. In this regard, I want to read a passage from the book. A telephone conversation between Zarko and Violetta on the day of her ninetieth birthday. A conversation that, in my opinion, is the essence of the book and of of Violetta’s life: A little story? – asked Zarko – Not at all, Violetta! It is such a beautiful, interesting, refined, and educated story intertwined with all the historical and political context of the twentieth century, with its tragedies and hopes, with its falls and its resurgence. This history cannot be forgotten. You went through the vicissitudes of political persecution and landed in an extraordinary family, with a husband who loved you, with a son who adores you. Probably, in the lives of other artists there have been equally beautiful events. But I don’t know any other story as beautiful as yours. How lovely of you, Zarko – replied Violetta – with these words you make me forgive you your absence at my party. You know I have always told you those things – concludes Zarko – They are my rooted convictions. You, dear Violetta, are the synthesis of providential and casual, astral, metaphysical and astrological confluence. Everyone can explain it the way they want, however, your story is for me, not just for me, but for those who know it and will get to know it, an absolutely extraordinary heritage, which cannot disperse. It would be useful to young people, to young people who want to devote themselves to dancing and understand that dancing is not just any job, a job like any other. I therefore invite all the present and all my students to read this extraordinary book about dance, life and love. Thank you! Good evening everyone. Thank you for your speeches. I thank Mayor Tito for his generous expressions of appreciation addressed to the already long story of my professional, public and journalistic life, which moved me, and for the unexpected and very welcome proposal of the honorary citizenship, which is a great honour for me. I thank all the participants and, above all, Councillor Balzano, not only for her refined work, but for having selected four fantastic women as speakers. No one better than a woman can deeply grasp the personality of a great artist, such as Violetta Elvin, a courageous woman, a lover of art, beauty, life and freedom. Meta has warmed and warms the lives of all of us. We have listened to fantastic speakers, dear Mayor. You’re surrounded by extraordinary women, established professionals. Meta has always fascinated me, not only for the natural warmth, but because it is the land of women who were left on their own, and they had to continue their lives to bring up their children by themselves. It was not a simple task at all that of the women of Meta, sailors wives, wives of commanders, who were left on their own sometimes for months or years, who had to manage the family and look after not only the economic resources that were available, but also, and above all, look after the education of their children. The women of Meta had to play multiple roles. Here lays my admiration for the women and for the entire community of Meta. Thank you all!